This house lolls in a droiling back street. that duvets dreams of fish and strange meetings. shifts the dust around our cat-shod toes. of lost lovers sliding gently across my belly. these dreams and, on a clear night, your star. No Entry to Persons with Conditions of the Heart! a dark helix quarried into the granite. shuffles down; Reeboks rasp on stone. through our backpacks, cameras, I Heart Italy hats. ascending turn by turn into the Renaissance. that scorched heretics but bankrolled the painters of angels. William Stephenson teaches English at the University of Chester. Richard has published three novels, all with Faber & Faber. His poetry collection, the light user scheme, is published by Smokestack. fate won’t take a break. we hear the world’s sighs. Magda Kapa was born in Greece, lives and teaches in Germany, writes in English, and tweets micropoetry as @MagdaKapa, some of it published online in qarrtsiluni. Conor Kelly has had poems published in Irish and American magazines. He now lives in rural France. of New Ross where your ancestors were from. but it was a fool’s errand you took me on. wherever you are, travel safe, my love. rocks to send thudding down the hillside. goes about her business uninterrupted. families relaxed in the certainty of summer. Sue Dymoke‘s latest collection Moon at the Park and Ride is published by Shoestring Press. arcades on a Tuesday afternoon. and a car, full to the sunroof, of saltwater. Russell Jones is an Edinburgh-based writer (The Last Refuge and Spaces of Their Own), editor (Where Rockets Burn Through) and researcher. and a new candle, painted in wax with your name. wrap words like cowrie shells to take back home. *Trains, seagull, “head, shoulders, knees and toes”. ** Fairy, mermaid, goblin, dragon. Kate Garrett lives in Sheffield. She is a mum of three, and has been published online and in print. 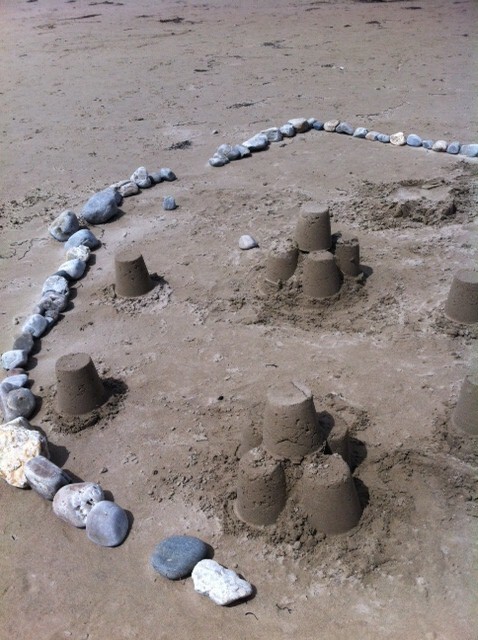 Can you look after these for the sandcastle? lie in the shade of my chair. that this is within my power. These things I can protect. Ailsa Holland is the founder of Moormaid Press and Library in the Landscape. She tweets occasionally at @ailsaholland. And sculpting turrets with such tenderness. The moat you dug for us is full of love. Never mind there is no running water (small giggle). And cheering at that chiming van? Climb down off your father’s shoulders! He’s stashed your tools in a carrier bag! Come back! We need a plumber! Dead crabs are coming in through our windows!